If you’ve ever accidentally sat on a wasp, you’ll know that an insect sting can ruin your day, but that’s nothing compared to what nature dishes up on the highest levels of the pain index. The bullet ant from Central and South America inflicts a sting that feels like "walking over a flaming charcoal with a 3-inch nail embedded in your heel", according to entomologist Justin Schmidt, and lasts for a full 24 hours. If you want to see exactly what that looks like, the video below by the Brave Wilderness Channel shows you in excruciating detail. Presenter Coyote Peterson describes the pain like "being shot by a gun" for 24 hours straight. But before you skip to the 13-minute mark to see Peterson writhing on the ground and fretting that his neck muscles feel paralysed, there’s plenty more here to unpack. In his quest to scale the pain index and experience first-hand the most powerful punches our insect friends can inflict, Peterson starts off by putting his hands into a swarm of harvester ants - a common species in the southwestern US. Sixty stings latter and not that worse for wear, Peterson finds a nest of fire ants to stick his hands into. The initial pain didn’t seem so bad, but if you’ve ever wondered what a hand COVERED in whitehead pimples would look like, umm, well, skip to 2:19 and say goodbye to your lunch, as Peterson reveals the aftermath. For a second opinion, American entomologist Justin Schmidt, who's been stung more than 1,000 times by at least 83 different species, has made his own pain index. He describes a sting from a fire ant as: "Sharp, sudden, mildly alarming. Like walking across a shag carpet and reaching for the light switch." For reference, Schmidt gives the fire ant sting a pain level of 1. 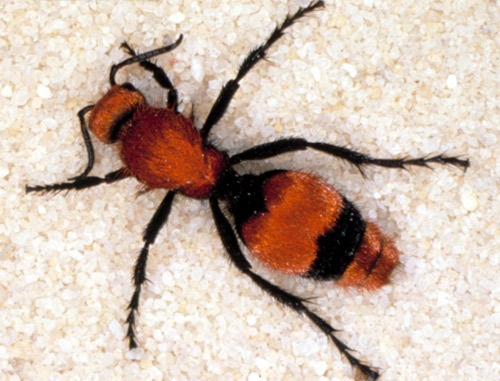 Next, Peterson forces himself on a velvet ant, which is an incredibly beautiful insect from North America, and is technically a wasp. Boasting one of the longest stingers in the world, relative to body size, it sends Peterson into "agonising pain" for nearly 30 minutes. According to Schmidt, the pain is: "Explosive and long lasting, you sound insane as you scream. Hot oil from the deep frying spilling over your entire hand." Growing up to 5 cm long, these things are so huge and intimidating, even the most avid insect-lover would want to keep their distance. And as Schmidt says, the pain of its sting is like: "A running hair dryer has just been dropped into your bubble bath." And now we’ve arrived at the most painful insect still of all - the bullet ant (Paraponera clavata). Quick note: seeing as pain is subjective, there’s a bit of a tussle going on between the bullet ant and the warrior wasp for which has the most painful sting. Schmidt puts the warrior wasp at the top of his pain index, but gives both insects a pain level of 4, and while the warrior wasp might initially inflict worse pain than the bullet ant, it lasts mere minutes - the bullet ant will have you incapacitated for hours. Bullet ant venom is laced with Poneratoxin, which is a paralysing neurotoxic compound that directly affects the central nervous system, causing slow, long-lasting and incredibly painful muscle contractions. Watch the video above from the 13-minute mark to see the full effects. The video is long, but the previous insect stings all take place within the first 3 minutes, if you need to skip around. To be clear, this isn't really something anyone should be doing, because it's putting yourself at an unnecessary risk, and the insects don't exactly enjoy it either. But, for what it's worth, each time Peterson gets stung, he takes the time to safely capture the insect before writhing in pain, so he can release it back where he found it. For a different perspective, here's Hamish and Andy's take on the bullet ant sting (spoiler: somebody gets the morphine).